Cold shooting third quarter leads to end of season. Shontavian Manuel gets a rebound. After starting the season 11-2, the Royals won just three of their final 12 games to finish the regular season 14-11. Amongst the losses included blown leads against both Dodge County and Washington County. Despite that, BCHS was fourth seed going into region tournament play. A Patriots player defends Nykeem Farrow's shot attempt. 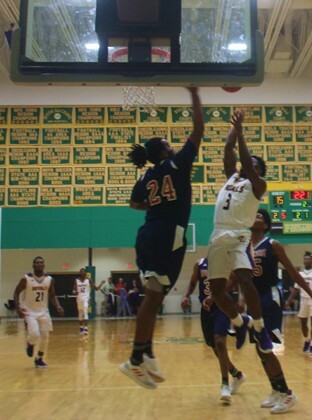 They�d avenged a previous loss to Southwest by winning in Macon last Friday. 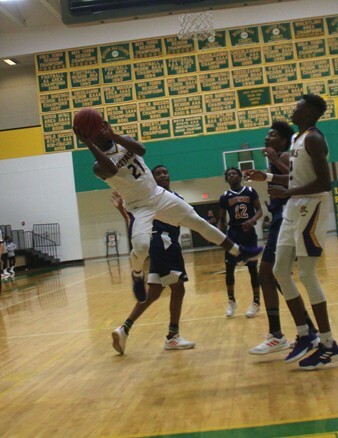 Tuesday, Bleckley took on the fifth-seeded Patriots in round one of region. Though leading 18-15 lead in the second, five straight by Southwest put them ahead by two at halftime. 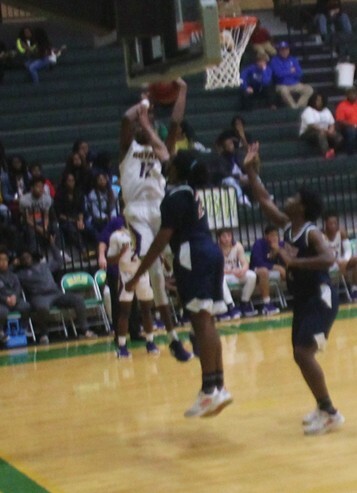 Deandre Pitts is fouled on this shot. BC managed just eight third quarter points as the deficit grew to eight. A Nykeem Farrow three-point play with 1:21 left cut the deficit to five but Southwest scored six straight to win 46-35. Farrow had 19 points, Shontavian Manuel scored 10 points.